This wonderful short story was written in 1898 by Charlotte Lodge, a talented high school aged student of Saint Clara Academy, the girls’ school on Sinsinawa Mound, run by the Dominican Sisters. It was published by The Young Eagle, the Saint Clara student magazine, of which Charlotte was also one of the editors. That’s her in the middle, in the square picture featured on this article. I have a real admiration for this story, because it is well written and I really get a sense of how Saint Clara Academy was fostering real love for the Catholic Faith, and building up the girls in virtue, and fostering a beautiful Catholic culture. Kids and adults today should still be enriching the culture by writing deeply Catholic stories like this one, making Catholic Christian art with a moral and spiritual depth, real attention to beauty and connected with all our rich tradition while speaking right to the hearts and lives and deepest concerns of people today. Down through the ages, that’s been precisely the source of some of the greatest of art, writing and music. This is just a simple story by a school girl, but I think that’s why it’s so great and and an example to us who are also simple ordinary Catholics who can use the skills and talent God gave us, to serve Him. sang Lora in a shrill, high tone. The above conversation took place in the “Study room ” of the graduates of a certain academy in ——-. The girls had been discussing the Thanksgiving ball, which, as usual, was arousing great interest. This year the interest was intensified by a friend of the institution promising a prize for the most original costume designed and made by the fair wearer at the coming ball. ” I have my costume all made and a mask to match, and although I have no idea of getting the prize, I am sure no one will recognize me,” answered contented Lora. ” What is it ?” and Lore’s fancy work went flying on the table. Kittie looked up from her paper and caught the surprised look on Lora’s kind face. Her own face flushed deeply. “Oh! I presume you’r shocked, Miss Propriety; a person can’t be the least bit independent but you go rolling up your eyes as though they were the most despicable person living; you’re a fine friend I must say, and I’m not going to stay in here another minute. Kittie’s grammar when excited was not such as to win the praise of her language teacher. Giving the books an angry push which caused them to fly in all directions, before Lora could utter a word, she had gone out of the room banging the door after her. Along the corridor she went feeling angry and discontented with the whole world. She had not thought in what direction she was going, until all of a sudden she found herself before the Chapel door. At first the thought of where she was irritated her all the more; she didn’t feel like going in, yet she had promised the souls in Purgatory that during the month of November she would make a visit for them every time she passed near the Chapel. The struggle was short for her keen sense of humor showed her the ridiculous side of the occurence. Quietly she stole into the Chapel. In the silence of the gathering twilight she recognized her fault and generously promised to make reparation. Thanksgiving Day dawned bright and cheerful, the frosty air, the frozen ground gave promise of a merry sleigh-ride soon. Indoors was a scene of joyous confusion. Happy groups of girls were busily engaged investigating the contents of their Thanksgiving boxes, but strange to say, mischief-loving Kittie was not with them. In her white draped alcove she was putting the finishing touches to her costume. ” Who is there?” asked Kittie a little sharply. “I’ll come out,” said Kittie impatiently. “Why! are you not going to take part?” asked Kittie her impatience changed to compassion. Myrtle’s eyes filled with tears. Why did the thought of the resolution made in the quiet Chapel recur to Kittie’s mind? Turning from Myrtle she sought to still the voice that sooner or later whispers to every generous heart, “sacrifice, sacrifice.” It was hard, doubly hard now. She thought of Birdie Ross’ spiteful triumph; of the pretty watch and chain she had seen yesterday; of the dainty costume, and then– impulsive Kittie had won the victory. The matter was settled and Myrtle ran away happy and contented sure that what Kittie promised she would fulfill. At last the most impatient was satisfied as Thanksgiving night came. The spacious hall was ablaze with lights. Gaily colored bunting fell in careless, graceful folds from picture and archway. Row after row of chairs filled the lower part of the hall; the dear, mild face of the Mother Superior looked contentedly around at the Sisters as much as to say, ” We may anticipate a pleasant evening for our children.” The grand march commenced, the doors were swung open and the ball began. Pair after pair of gaily attired dancers entered the hall. There was Hamlet, Ophelia, L’Allegro, El Penseroso, and a host of others. A cry of admiration and every eye turned towards the door where Hope, her beautiful clinging robe fastened with tiny anchors; and having in her hand a cluster of lovely Easter lillies which bid all hope for the Resurrection, stood leaning on her golden anchor. An older girl’s drawing of a “minim,” also from the Young Eagle around the same time period. That’s what Saint Clara Academy called the littlest girls in the school. “She’s got the prize! She’s got the prize!” cried a cried a group of Minims showing their interest by screaming at the top of their voices until an opportune warning told them that they were getting boisterous. ” Who is it?” ” Who is it?” The pretty little mask hid Birdie’s face and she had kept her costume a secret. Yes, it was almost certain that the prize was Hope’s and Birdie in anticipated triumph was dancing around on tip-toe. Suddenly the hum of voices stopped and the momentary silence was followed by a prolonged oh! There framed by the darkened doorway stood a picture not easily forgotten. Two tiny Minims dressed as snowbirds were harnessed with white ribbons to a little chariot which looked very much like a bank of snow. Seated in the chariot, the filmy white clouds of illusion sparkling with diamond dust, and caught up by sprays of mistletoe, a crown of icicles reflecting the bright lights, and the fairy wand setting myriad silver bells chiming, was the Snow Queen. The lights flashed on the diamond dust and the icicle crown until it seemed as though a sudden burst of sunlight followed her entrance. Around the hall went the little chariot; not all the loudly whispered praise could make the queen forget her dignity or give any hint by which they might guess who she was. The march ceased and everyone held her breath as the judge stepped forward and addressed the girls: “Before awarding the prize we would like to hear your decision.” A loud cry of the “Snow Queen,” the “Snow Queen,” followed. “Myrtle, Myrtle,” everyone echoed, “why we thought it was Kittie.” Myrtle soon found herself in the centre of an excited group of eager questioners, but the secret of who had been her Cinderella god-mother was safe in her keeping. No one noticed the tear-stained face looking through the half opened door as Kittie stole away to hide her grief where her anger had been healed. It was just a week until the Christmas holidays. Thanksgiving was but a sweet memory. The girls were busily engaged during recreation hours making presents for the loved ones at home. The long hall, where all assembled during these precious moments, looked much as usual, but the girls seemed a trifle quieter. It was as though some loved face and merry voice were missed, leaving a feeling of sadness. Yes, it had been thus ever since Thanksgiving; things did not seem to be just right. 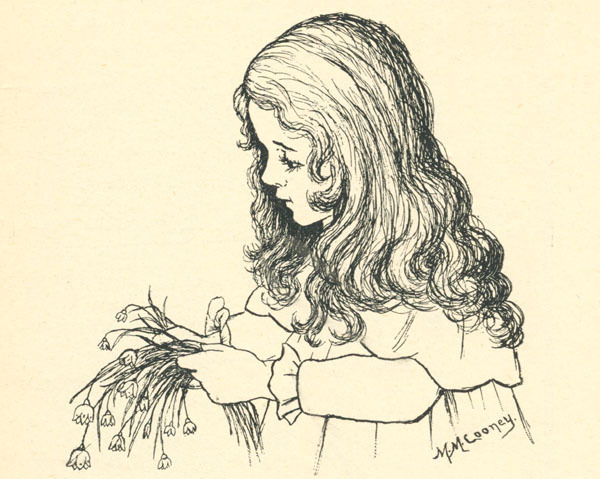 Of course, Kittie was never among the girls as she used to be, with her cheery laugh and sunny disposition—but then one girl could hardly make such a difference. Today seemed gloomier than ever, a stillness that comes before a heavy snow-storm pervaded the air. ” No doubt, Sister Marguerite knows all about it, so it wouldn’t be any use,” said Mary Wright, trying to play the part of comforter to her friend’s sister. ” What’s the matter with Winny? ” exclaimed Birdie, coming up with several of her friends. It was soon explained. Not far from the girls sat Myrtle, working on a little gift for Kittie. What would she do ? Unwittingly, she had heard their conversation and now sat grief stricken. Was that what they meant when they told her about the dress ? Was she the cause of Kittie’s disfavor ? Should she explain ? She had promised not to, and Kittie was quite annoyed once when she proposed telling. Besides, if she told, they might think her mean’to have accepted the dress ! But then she had thought Kittie was going to mask too. Oh ! if she only could tell. Conscience-stricken, she sat until Birdie’s significant remark about the dress, then with one bound, Myrtle stood in their midst, her eyes flashing and her voice almost choked with sobs. Myrtle’s indignation was fast rendering speech incoherent, and the girls, in the first surprise of seeing their gentle little companion so transformed, did not grasp the true meaning of her explanation. Gradually, though, they calmed her and made her tell them all about it. “Well,” said Winnifred, ” the first thing I’m going to do is to spread the truth to make up for my part of the mischief; ” and the small whirlwind rushed off on a message of reparation. Winnifred had kept her word, the good news spread, and more than the news: a noble resolution was on foot, but no one was to tell the secret. All were advised to treat Kittie just the same for the present, but few could help giving her, at least, an admiring glance. Kittie mistook this for pity and felt worse. Sister Marguerite, however, had been told and thought everything was progressing excellently. Quickly, the days went by until Christmas eve. No pupil was permitted to go home at Christmas, but as many expected their parents and friends, they were generally in the best of spirits. Tonight, they were beaming with unusual animation and pleasure. Smothered whispering and happy laughter pleasantly filled the large hall in which they had assembled to hear the result of last week’s voting. It was a tradition in this school to trust to the “honor “of the pupils. Indeed, some thought always living on one’s honor a little troublesome, but the wise Directress knew the true chord in every real girl’s nature could thus be touched. Hence the awarding of the highest honors of the school was left entirely to the votes of the girls. Even the most frivolous coveted the medal given Christmas eve and placed by the happy recipient for that night in the Crib, that she might, as it were, receive it Christmas morning from the tiny Hands of the Infant King. At length, Mother Superior entered, and the girls, who had waited patiently, could now scarcely command their feelings. Before telling the name ‘of the chosen one, she spoke wise, tender words of the coming Festival, and then told how glad she was, under the circumstance, that the vote was unanimous. ” Kittie, Kittie,” every voice responded. Poor Kittie was a picture of the direst confusion, and the wild burst of applause such as only girls can give, added to her discomfiture. Yet she was happy, the Souls were grateful. I leave you to imagine the joy of loyal Myrtle and faithful Lora as they ran to embrace Kittie. Among the first to congratulate her was Birdie. As soon as she could escape from her enthusiastic friends, Kittie ran to the Chapel. Sister Marguerite met her as she was returning from her visit. ” I’m glad for Mamma,” said Kittie simply, as one or two rebellious tears rolled down her checks, “and I’m glad for myself, but I wanted so badly to make the sacrifice and have it a secret from all, but– ” a glance backward where the glow of the Sanctuary lamp shone finished the sentence. “Your sacrifice is hidden, dear, safe in His Sacred Heart.” CHARLOTTE M. LODGE, ’99. 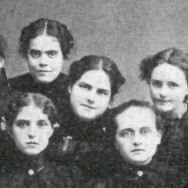 The 1899 editorial staff of the Young Eagle magazine. 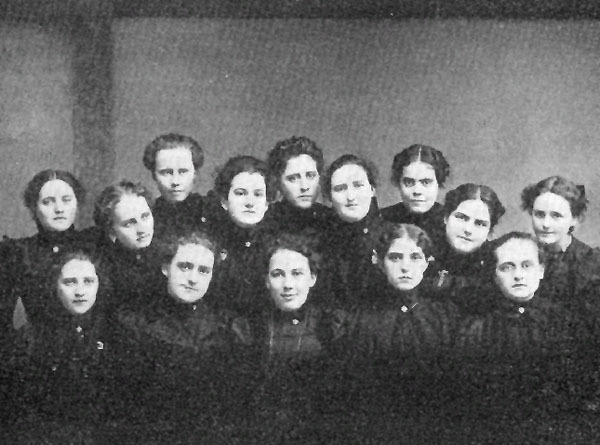 I believe Charlotte Lodge, author of “Kittie’s Trials,” is the third from the right.